The White Dog Blog: Change is good, right???? There is a lot of OUT WITH THE OLD, IN WITH THE NEW going on around our house. Lots of change, puppers. And, it will probably not surprise you that I DO NOT LIKE IT. Despite the Westietude you hear of so much, I am not so tough. Don't tell the ladies. 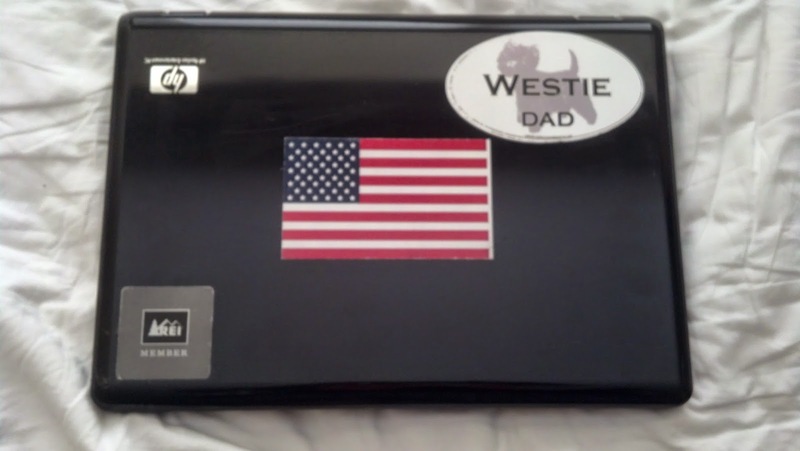 My dad actually had the nerve to get rid of our his Westie Dad laptop. Can you believe that? Pretty bold move on his part, yes? To change being good, I say pffttt. I think not. Please tell me there will be a new Westie Dad laptop. I too don't like change. First it is the yaptop and then dude who is next???? Have a wonderful Wednesday. No we don't like change either, we like it when momma sticks to the schedule. Change is ONLY good when you get it Back at the Registers of the Treat and Foodable Stores... ¢ ¢ ¢ Just sayin. Oh no,I don't like change either. I luffs routines and thingys. When they try to change dinner time I let them noses its unacceptable! What da woof?? Gettin rid of da westie dad yaptop? Boy....he better have saved the Westie logo! You must pee on something to show them who is boss! He needs to order a laptop skin wiff yer cute face on it!! I am not big on change either. Things are fine just the way they are! Crikey Duncan ...... change is NEVER good!!! Pfftt, pfffttt and double pffftttt, I say!!!!!! Nope! Not big on change here either Duncan!! Butts, maybe your Pops will get a new better, faster more Paw-friendly yaptop! Just make sure he saves that Westie Dad logo....GOTTA save that!!!! Some changes are easier than others. Me and Stanley like routine! Oh no!! None of us like change and certainly NOT me!! HAHAHAHA Mom is feeling guilty. YAY!! !